Camp Bullwheel began with an epiphany: Frank Bell suddenly realized he owned an older rental house in scenic Ennis, Mont., which could make an old friend’s dream come true. He thought the property might be just what Peter Paulwels needed to allow him to host disabled guests, including veterans, and give them a wonderful outdoor experience with fishing at the forefront. The area surrounding Ennis offers just the right kind of environment for such a camp. A quiet town with a population under 1,000, Ennis lies in beautiful Madison County, in the southwestern part of the state. The Madison River flows past the town as it descends from West Yellowstone. Ennis is flanked by the Tobacco Root Mountains to the northwest, the Gravelly Range to the southwest, and the Madison Range to the east. About 12 miles north, the Madison Dam creates Ennis Lake at the head of Bear Trap Canyon. In September of 2017, Bell and Pauwels met with a group of like-minded, experienced people to discuss how to make the concept of Camp Bullwheel become a reality. The group determined that the new Camp’s mission would be to “Provide quality outdoor experiences for people with disabilities and their chosen companions.” They decided the current property should be renovated, with the long-term plan to build a new, state-of-the-art facility designed especially to accommodate special-needs individuals. There was a lot of work to be done if Pauwels and Bell were going to get the operation up and running by the summer of 2018. The two friends immediately surveyed the property in earnest, taking notes, measurements, and photos. They decided to begin renovations on April 1, 2018. Through first snow and then rain, the friends worked to adapt out-buildings, assisted by several of Pauwel’s fellow volunteers at Craig Hospital in Denver, Colo., where Peter has volunteered for over 25 years. All of the hard work paid off; in June, Camp Bullwheel’s first “campers” were welcomed. 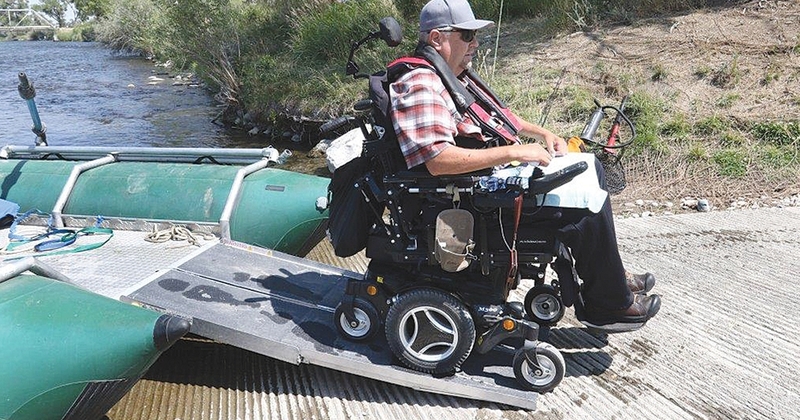 Bullwheel is remarkable for its use of adaptive technologies that allow people with disabilities to raft and fish. Currently, there’s one 16-foot double pontoon boat with a low center of gravity design, refined to readily accommodate people in both motorized and non-motorized wheelchairs. In the future, depending on funding, the staff hopes to add a second boat. The Camp also utilizes a unique creation called the “Fishinator,” which was designed in the rehabilitation engineering laboratory at Craig Hospital in Denver. This tool allows individuals with high spinal cord injuries to—using a “sip” and “puff” device—cast, retrieve at variable speeds, and set the hook at their own command. The Camp welcomes families and friends of special needs individuals through their “Family & Companions” program. This program gives disabled people the opportunity to take a rafting and fishing vacation with loved ones—so everyone can relax and enjoy the beauties of nature together. Camp Bullwheel achieved some impressive first-season statistics: Five veterans with TBI’s (traumatic brain injuries) and nine people with spinal injuries were served. There were 33 participants, including family members. Five hundred and sixty miles of river were floated; 950 meals were served; and 4,800 shuttle miles were driven. The Camp received $12,500 in donations, including in-kind donations. Five staff members and 24 volunteers helped to make the Camp run smoothly in its inaugural season. Many of the volunteers are former members of the military, making them particularly insightful when assisting the veterans who have participated in the program. The staff members include Paulwels and Bell, Chris Clasby, Jackie Kirtley, and Tom Riggs.